The Lanier 5613 is a versatile and reliable black and white digital copier that features a smaller dimensional footprint and rated volume output in its design, which is targeted to smaller companies with limited space and limited budgets. Marginal copying speeds coupled with sturdy construction ensure reliable performance with maximum up time and decent paper handling capacity, allowing as much unattended operation as possible, freeing a user to multitask and make more efficient use of time. The Lanier 5613 can deliver copies at a maximum rate of 13 pages per minute at a resolution of 600 dots per inch for decent image quality. A maximum paper size of 8.5 x 14 can be accommodated. An optional 10/100Base-T Ethernet controller comes with an RJ-45 connector that enables hookup to a router, hub or print server, providing a much more practical and efficient way to connect to a PC. The machine can also be connected via a parallel port to a PC with software tools that allow anyone to closely monitor toner and paper levels. Resolution enhancements and emulations are designed to match the quality and grading of some of the higher-end laser printers used for business applications. The paper input trays can hold up to 850 sheets of paper to reduce the frequency of reloading. The 5613F model variation features a business-class faxing module with a built in 33.6 Kbps modem that can scan and transmit at a rate of roughly 3 seconds per page, cutting down on long distance bills incurred with slower fax times. A separate photo mode tailors resolution to graphics and images to ensure clean, clear and sharp digital reproductions of original prints. Two full-size pages can be scanned into the machine and scaled down to print on one piece of paper for further consumable cost savings. A well-equipped user control interface makes programming copy jobs easy and convenient. A maximum monthly duty cycle of 2,000 pages is recommended based on the estimated workload demands of a small business or office but this unit can handle up to 5,000 pages with no problems or sacrifice of quality, offering long-term protection of a small business's investment. 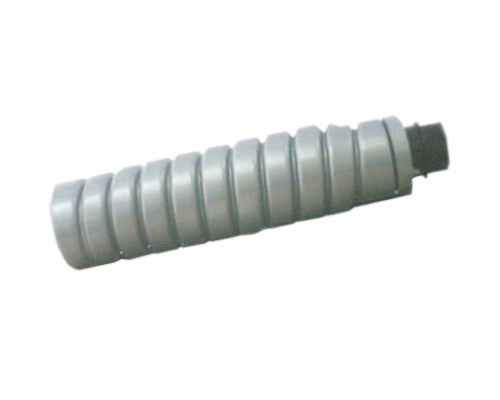 A toner recycling system is designed to maximize toner cartridge yields while minimizing waste, which in turn lowers the costs of consumables. The dimensional footprint and weight of the Lanier 5613 allows for use on virtually and table top, desk or work surface while saving precious space. First copy time is an amazingly fast 8 seconds from warm up to release of printed page, which is only twice the standard print speed of 13 pages per minute. The two models that are available come with relatively low amounts of RAM memory, with 8 or 32 MB options, limiting the capabilities of this unit as a PC-connected printer and staying completely true to the target small business copier need. A 30 page document feeder is only included with model 5613F, leaving owners and lessors of the base 5613 model to manually feed originals, essentially making the 5613 a 1-page document copier. The optional printer module comes only with a parallel connection interface, eliminating direct connectivity with a lot of newer computers. Driver support is limited to Windows 2000 and prior, with no guaranteed support for XP, Vista, Windows 7 or Microsoft Server operating systems. Macintosh computers with OS8 and OS9 are the only ones that are guaranteed full driver functionality. 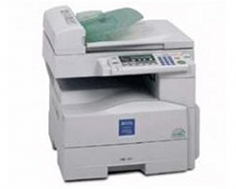 Overall age and obsolete interface technology limit this device's usefulness at this point to mainly stand alone copying and the best cost solution for that is the base model without printing or fax capabilities. This also means, though, that a business is stuck with manual copying at one page at a time. It would be easier to justify purchasing or leasing the 5613F, despite increased overall cost, to avail a company of fax and automatic sheet feeding capabilities. 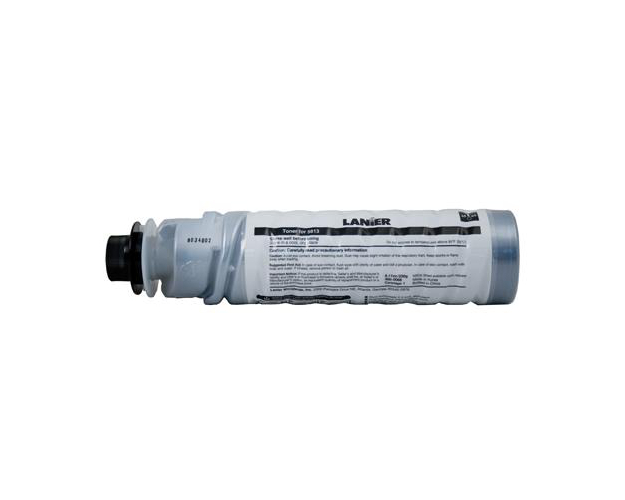 Review it: "Lanier 5613 "
Only one type of black toner is available for the Lanier 5613, with a yield capacity of about 7,000 pages, which amounts to a cost of less than a half a cent per printed page.